Premier retractable and roll screens are a wonderful solution to the ever-present invasion of insects. They are unlike any screen on the market. They are designed to look good, enhance windows, and provide comfort and convenience while keeping you free from flies and other insects. 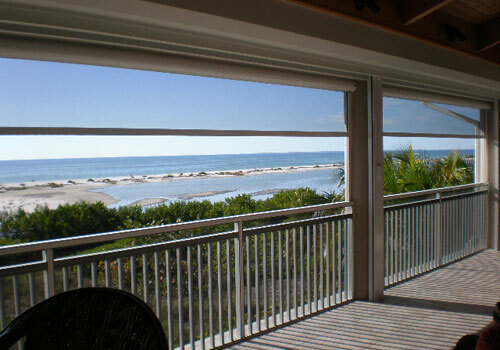 Premier retractable and roll screens roll like a window shade to provide unlimited views. Screen and draw bars move freely in aluminum extruded guides on each side of the window, allowing smooth operation. When otherwise not in use, they are concealed in overhead housing. Premier can custom fit almost every type and size of window and door. Premier’s smooth-sliding screens disappear into the window frame, making them invisible. Our retractable and rolling screens are designed to enhance the beauty and dignity of a home or business. They provide fresh air, great appearance and functional protection. Living in Florida gives us tropical breezes and gorgeous vistas. Now with Premier retractable and roll screens you can enjoy it all!